These are the Thailand snakes that can kill you because of their highly toxic venom. This does not include constrictors. 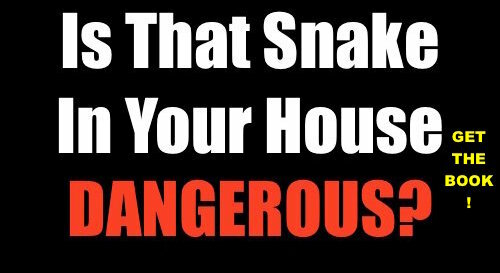 Is That Snake In Your House Dangerous? 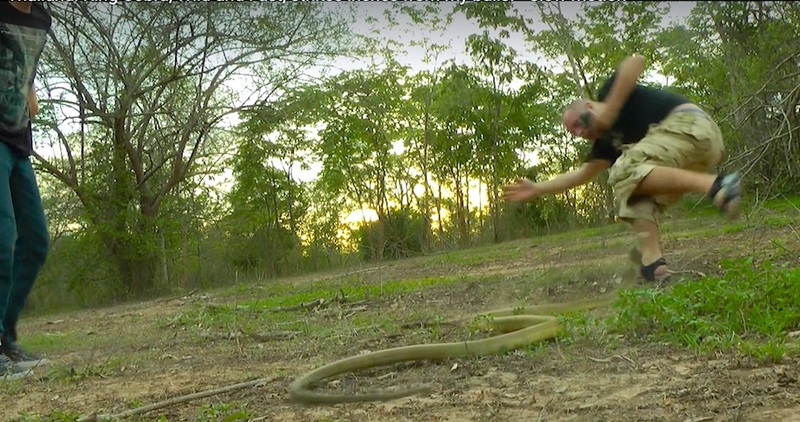 Identify Deadly Thailand Snakes in Under 5 Minutes! 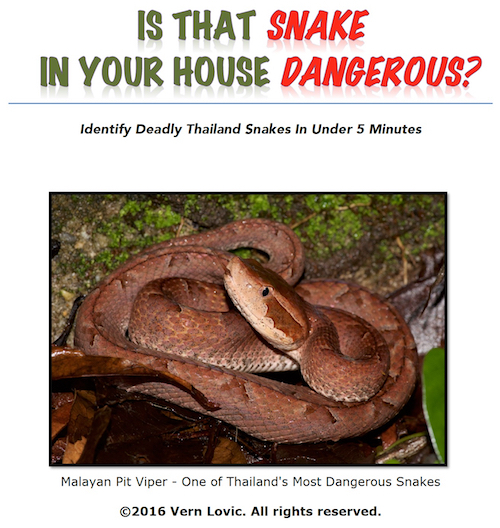 The Only Book You Need As a Homeowner in Thailand to Help You Identify Dangerous Snakes. 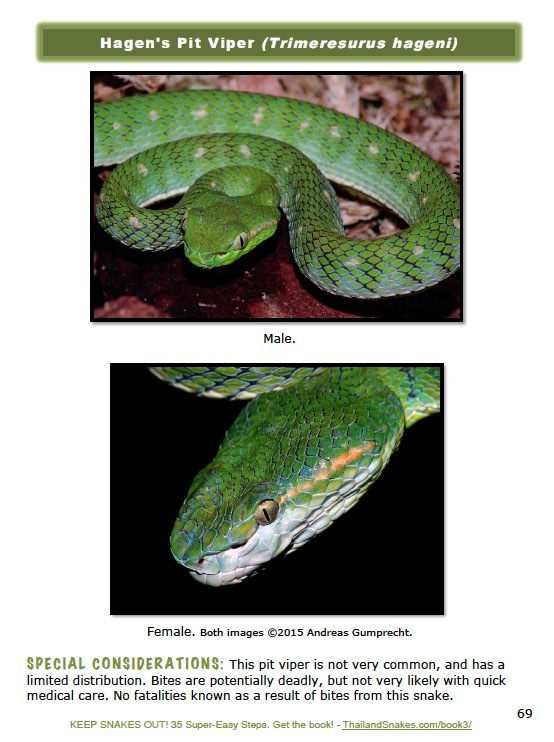 High Resolution Images of the Snakes So You Can Identify Your Snake QUICKLY. 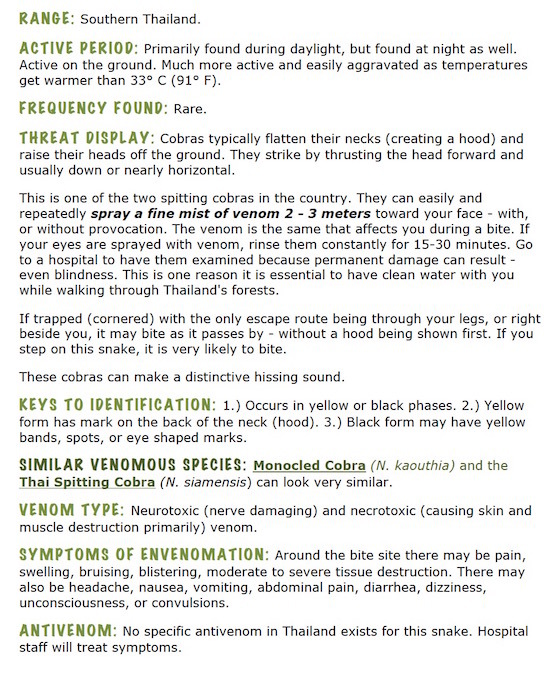 DETAILED FACTS of the 35 Most Dangerous and Deadly Snakes in Thailand. Every snake has detailed instructions about preliminary first aid you must do before reaching the hospital. The Blue-necked Keelback, though not likely to be found in your house, could be in your yard or you might see one on a hike. We have extensive information about each snake’s venom and behavioral characteristics besides photos and detailed description how to identify each. I got a call from my friend this morning. He told me they caught a 2+ meter king cobra at a palm plantation the night before. He said it was super fast. Well, my first thought was – when they’re young and smaller like that – under 3-4 meters – yeah, they are quite quick. The juveniles up until about 2 meters are usually fast. I have yet to work personally with a king cobra less than 2.5 meters. I want to – but, will respect their speed a lot more. The juvenile king cobras are like a completely different snake than the big ones. They move differently – darting their heads around constantly, and very fast and short motions. The bigger kings are more deliberate in their movements and are much slower, even when straight from the wild. Not to call them slow – but, you can work with them to some degree without dying. I took the motorbike over to see the snake after lunch. My friend was sleeping on a bench. I woke him up with a clamp down on his foot – as if a snake bit him. He didn’t jump or anything, so I was disappointed my trick didn’t work. No matter – he woke right up and showed me the beast. He told me it had eaten two red tailed racers that morning, both of which were about 2 meters in length – but thin. I figured the king would be a bit slow and conserving energy as it digested all that food. I was so wrong. This king cobra was black with light bands – very light, I wouldn’t call the bands yellow- they were more like a yellow/green. It was under 2.5 meters and over 2.0. It had a very long hood – and was really gorgeous to look at. My friend always goes the extra mile… when he opened up the gate and showed him his face we got a big surprise from this snake. This king came up that tree stump faster than any snake I’ve ever seen. Not that I’ve seen it all – however, I have seen many fast snakes – rat snakes of all sorts, tree snakes, big, small, thin and fast… and no snake has ever pulled one of these maneuvers on me. I wanted to post this to give you an idea that you “think you know a snake” – but then one will do something you’ve never seen before. This has happened to me often as I learn more about monocled and king cobras. I’ve probably spent 200 hours working with them and studying them – watching other people work with them. I learned a whole lot in the first 50 hours and still, I’m always learning new behaviors and what these snakes are capable of. Every snake species has a range of behaviors that they can exhibit. Snake handlers know, in general, what a snake is capable of – because it’s a certain species. However, there are snakes within the species, that, for whatever reason – learned behaviors that are different from most of the other snakes – and when they exhibit them – it can surprise the hell out of you. Be careful with venomous snakes of all sorts – and never take them for granted. More info about King Cobras here. Red Necked Keelbacks are now considered quite dangerous and potentially deadly. 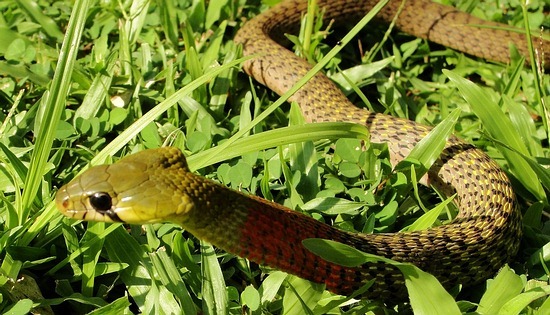 A couple months back I received an email from a concerned father whose son was bitten by a red-necked keelback (Rhabdophis subminiatus) he had found in their neighbor’s garden. These snakes have, in the past, not been identified as a dangerous snake. Many people have them as pets, and free-handle them with bare hands. Sometimes these snakes bite, but once they are handled a bit they usually calm down and rarely bite. 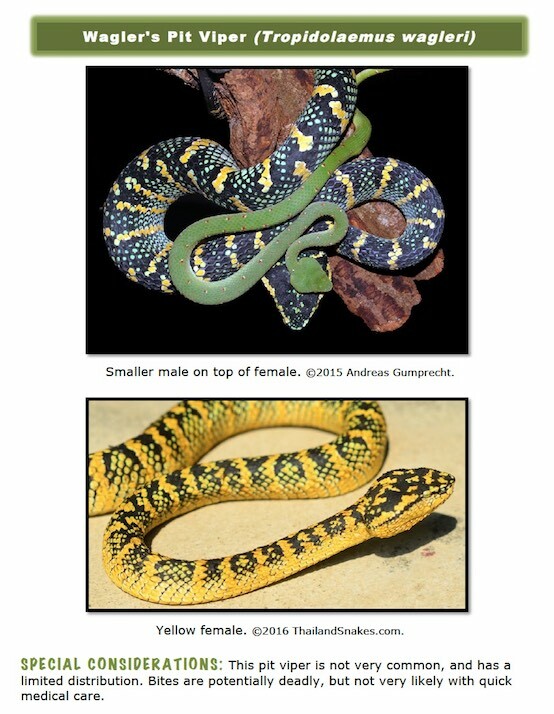 There have been some cases in the literature where bites have resulted in hospitalization, and there has been a push to identify these snakes as what they are – venomous, and dangerous. Colubrids, rear-fanged snakes, are nearly all venomous. Venom is modified saliva that helps the snake kill and break down the body of their chosen food. I was excited to have a response from the father of this boy that spent 2 weeks in a Thailand hospital after suffering 2 bites from this snake. 1. Can you tell anything about how the bite occurred? Was the keelback snake typically calm – and then, out of the ordinary behavior – it bit your son? Calm, he was showing off to his friend’s that he can handle snakes, this red-necked keelback was a wild one not a pet. He has a constrictor, a corn snake and a python as pets, all fairly placid, but the keelback he had no understanding of. Between 30-40 seconds I believe. It wouldn’t let go. 3. Did the snake bite more than once that day? Bit him twice within a few minutes. 4. Did the snake routinely bite your son – often? 5. Can you tell me approximately how long was the snake? Do you have any photos of it? Can you please send if you do? No photo’s I’m afraid, he didn’t mention how long it was, but he will be back from school at the weekend, and I’ll fish more info out of him. 6. Did you get the snake in Thailand? There in Phuket, or where? Wild snake in his friend’s garden (Phuket). Red Necked keelback – do not keep as a pet – can cause serious kidney damage. So, here again – the red-necked keelback snake bit down for an extended period of time – 30+ seconds, and had time to squeeze a lot of venom into the boy’s hand. Then bit again. There is no manufactured antivenin for the Rhabdophis subminiatus as it is here in Thailand. In Japan there is a small amount of antivenin produced to handle bites from their local species. To my knowledge there has been nobody treated with this antivenin outside of Japan, and I’m sure they would not be all that interested to give up some of their small supply to export to another country. More information on venom toxicity and treatment after bite by this snake: R. subminiatus. Venom consists of mainly procoagulants, which can cause renal failure; plus mild neurotoxic factors. Envenomation does not always occur. Bite may be almost painless, with minimal local swelling. Symptoms of envenomation may include local numbness, headache, nausea, & vomiting; in severe cases renal failure has caused human deaths. No known antivenom currently produced. LD50 for intravenous injection – .125 to .129 mg/kg. That is extremely venomous, in the same category as Bungarus candidus (Malayan Krait), Naja kaouthia (Monocled Cobra), and O. hannah (King Cobra). 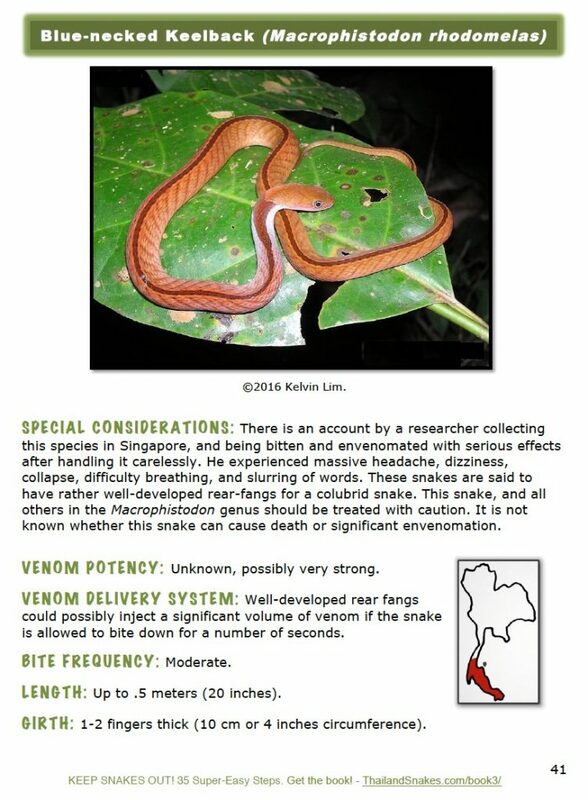 One WHO (World Health Organization) publication about the management of venomous snake bites in Southeast Asia mentions the antivenin for Rhabdophis tigrinus in Japan as having some effect on the venom of R. subminiatus. I am not sure if this is strictly for R. subminiatus found in Japan, or not. Worth a try though if you can get them to send you some antivenin. Otherwise, there is no other option – there is no monovalent antivenin specifically for R. subminiatus. I have some time today, and I’m curious what their response will be. I’ll write them to see whether they could, in an emergency, be able to send some antivenin here to Thailand to treat a bite by R. subminiatus or R. tigrinus. Greetings from Thailand! I am a snake enthusiast from the USA, living in Thailand for the past 11 years. I have been researching the subject of Rhabdophis envenomation because I have had a few experiences here, helping young boys who were bitten. In both cases, the victim was a young male child. One was 12 years old, and the other was only 9 years old. Both the boys had kept the snakes as pets and thought them to be harmless. Both were admitted to hospital intensive care for 10-14 days with bleeding from various orifices and ultimately renal failure. I have read that your antivenom may help particularly in cases of renal failure. On two occasions I emailed staff at “The Japan Snake Institute” about possibly purchasing some antivenom to help these boys recover. Unfortunately, I never received any reply from them at all. I am hoping you will reply favorably after reading this note! As you know, Thailand has not made antivenom for any snake in the Rhabdophis genus. R. chrysargos and R. nigrocinctus are also found in Thailand, and they may have similarly toxic venom. I anticipate more emergency situations involving children in the coming year(s) and I must try to help in any way I can. I am asking you if I can purchase some of the R. tigrinus antivenom for experimental use by hospital staff when patients in Thailand are envenomated by this snake. We are not seeking to make any profit from this venture, the antivenom will be provided to Thailand hospitals on a case-by-case basis, and at cost (no markup). As I understand your article to read, each vial of freeze-dried R. tigrinus antivenom, Equine (lot #0001) is able to neutralize the coagulant activity of about 4 mg of R. tigrinus venom. If we were able to purchase just 10 vials, or even 5, that could be a significant help to patients here in Thailand who need it – especially children. Would you please respond favorably to this request? Thank you for your time and concern about what will most certainly be in the near future – a life and death matter. 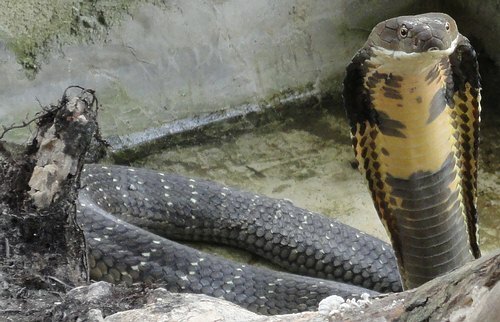 A king cobra let out of the bag for photos – almost turns deadly! Be careful up there guys! Amazing never been seen before footage (and I’ve seen heaps of stuff) of a King Cobra striking right for this guy’s balls! CLICK IMAGE TO ENLARGE. 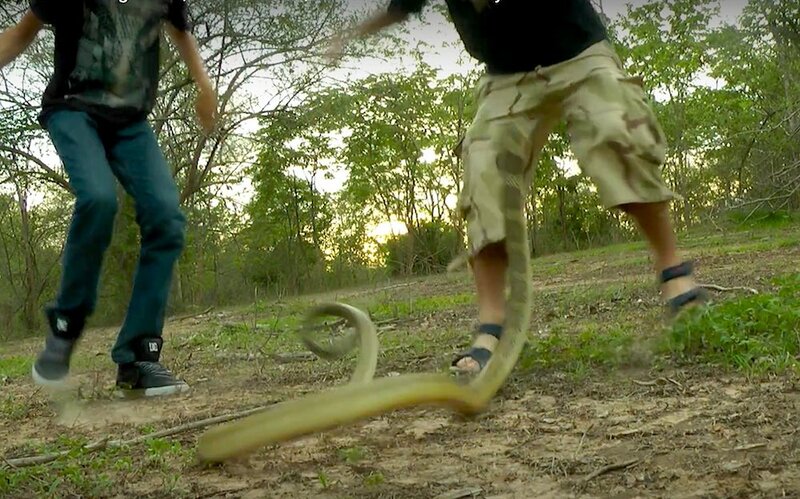 This is after the king cobra went through his legs, and was still moving forward. The guy is trying like hell to back up and falls. Luckily the king goes another direction. CLICK IMAGE TO ENLARGE. King cobras are dangerous not because they are super fast, not because they have the worst venom in the world (they don’t), and not because they are so big. They are so dangerous because they are so damn unpredictable, and because they are so big, they can do things that are hard to judge – and difficult to avoid. The guy grabbing the tail of the king cobra in this video has worked with kings for years. He thought he was far enough away that the king couldn’t come in that fast. Unfortunately, this king was energized and quickly flipped back for a bite at the crotch. Then, when it missed, the mouth is still open looking for something to bite. It was not happy at all. I handle king cobras very, VERY rarely. In the open area like this the king can move quickly because there are some plants and uneven ground it can use to grip the surface. It’s nothing like a road or flat, smooth dirt spot. So glad these guys are alright!! What DON’T You Want Hiding in Your Motorbike? Malayan Pit Viper (Calloselasma rhodostema). Deadly bites are possible mainly due to brain hemorrhage (bleeding), but most people just lose some of their flesh to this snake. The venom is a very strong and is cytotoxic. It destroys living cells of all sorts, including muscle and bone. 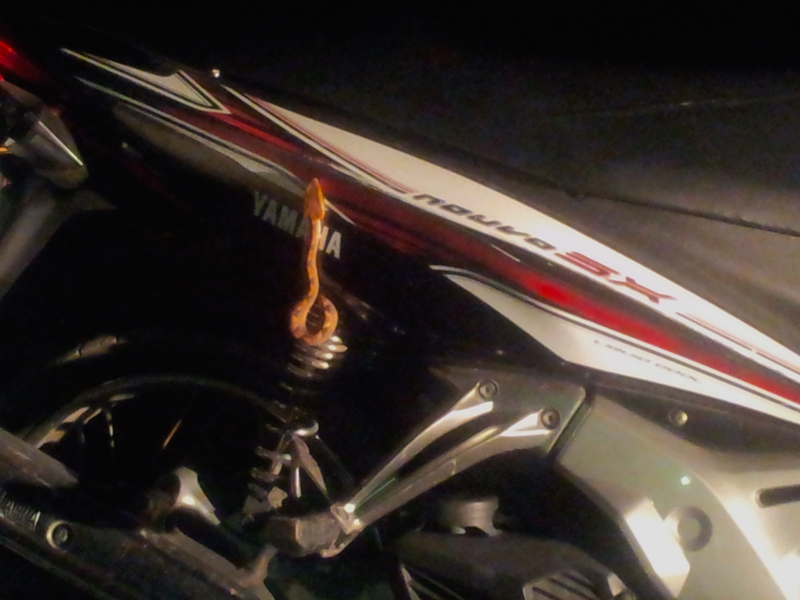 This is the snake you really don’t want to be hiding in your motorbike in Thailand! Bharath contacted me by email just after I went to sleep last night. He said his wife was touched on the leg by the snake which was hiding in the motorbike. Apparently no bite. LUCKY DAY! Author VernPosted on November 30, 2014 November 30, 2014 Categories Deadly Thailand SnakesTags deadly snakes, malayan pit viper ThailandLeave a comment on What DON’T You Want Hiding in Your Motorbike? Smallest Deadly Snake in Thailand? The baby cobras, kraits, Malayan pit vipers, and coral snakes can all kill you just like the adults of their species. Though they don’t have as much venom, or fangs with tubes wide enough to transfer as much venom as an adult, they need not to. Usually a snake like this can inject more than enough to kill a person. Some adult Malayan pit vipers are only 60 centimeters or so. That’s not a big snake. Big enough to kill you though. Take all snake bites seriously and get to the hospital as fast as possible after being bitten. Don’t wait for pain or other symptoms, some snake venom doesn’t give many symptoms at all at first. Hope for a “dry-bite” and that no or very little venom was injected! Author VernPosted on September 23, 2010 September 23, 2010 Categories Deadly Thailand SnakesTags baby deadly snake, deadly snakes, Thailand snakes, Thailand venomous snakes3 Comments on Smallest Deadly Snake in Thailand? The Deadly Snake Hardest to Identify in Thailand? Krait. The Malayan Krait (Bungarus candidus), or the Blue Krait as it’s sometimes called, is difficult to identify, and identifying it is essential because their venom is so deadly. Their venom paralyzes the nervous system and causes the muscles of the body to stop. That means the heart and diaphragm. You’ll need to be on a ventilator to stay alive after a krait bite. Maybe the hardest to identify deadly snake that you should be aware of is an albino cobra, krait, coral snake, or Malayan pit viper. Albino snakes are not common, but, keep in mind that any white snake that bites you could be quite deadly and you’ll want to get to the hospital immediately. If easy to kill the snake – do so. Don’t risk being bitten again. Take a digital photo of it, or a few – would be better. The photo above is the Malayan Krait. The photos below are snakes that are completely harmless. Keep in mind that Malayan Krait babies look just like these smaller innocuous snakes. Author VernPosted on September 23, 2010 October 26, 2010 Categories Deadly Thailand SnakesTags Bungarus candidus, id thailand snake, snake identity, Thailand snake3 Comments on The Deadly Snake Hardest to Identify in Thailand? Krait. The Malayan Pit Viper (Calloselasma rhodostoma) is the venomous (bad) snake that is most likely to bite you. They have the habit of lying in the short or long grass and just waiting for prey to walk by. If human footsteps are coming close – it doesn’t attempt to move, it just sits there. This is why the Malayan Pit Viper is the cause of most of the serious bites in Thailand, and Malaysia. They just don’t get out of the way, or flare up a hood or anything. They are what we call lazy snakes, and they’re quite deadly too. 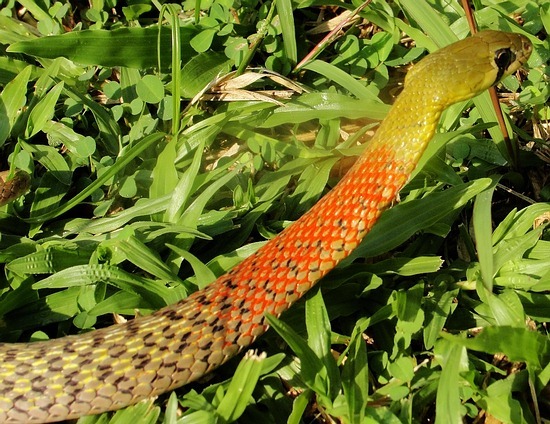 This snake is responsible for more deaths in Thailand than any other. However, if you make it to the hospital for the antivenin quickly you will likely be fine. Some herpetologists call the Malayan pit viper the “finger rotters”. Their venom is cytotoxic and destroys all cells of the body – including bone. Their venom dissolves bone… it’s quite harsh stuff and you DON’T want to be bitten by this snake because you’ll likely lose part of whatever what bitten. These Thailand snakes are most active during the night time, but, they seem to just sleep in the open grass during the day too. BE CAREFUL NOT TO STEP NEAR THIS SNAKE. Their bite is vicious and fangs go deep.